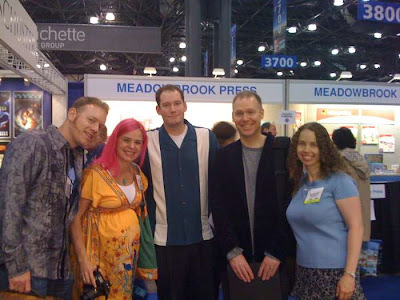 BEA stands for Book Expo America, the annual convention of publishers and booksellers. AWESOME is just a word in caps. 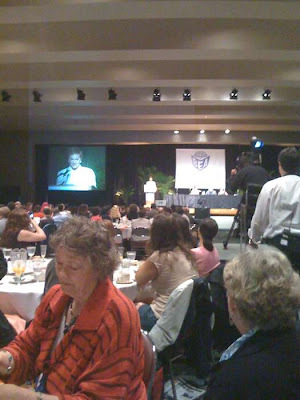 I woke up at 3am to catch a 5am train to reach the Javits Center in NYC by 7am to register before the 8am breakfast. This was early. Really early. 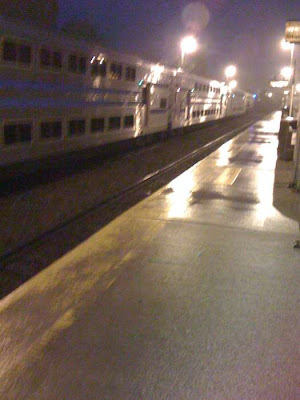 Train station at 5am. Dark out. Watching for vampires. By 7am, there was already a line forming for the Children's Book and Author Breakfast. I tweeted about this and then noticed a tweet from Lauren Barnholdt with a photo of the line from approximately the same angle as mine. I also noticed the woman next to me was tweeting on her phone. Yes, Lauren and I were standing side by side simultaneously tweeting identical tweets. Inside the breakfast room, I saw Jane Yolen and trotted over to say hello. She said my hair looked terrific. She immediately became my new Favorite Person. Julie Andrews was the master of ceremonies. When she walked out on stage, you could feel the tension in the room mount as hundreds of people suddenly exercised massive amounts of self-control in resisting the urge to break out singing "The hills are alive..." Tomie de Paola, in his speech, did not resist the urge. After the presentations, I scooted out to the bathroom and... (this is cool so please pause here for dramatic effect)... washed my hands next to Julie Andrews. And summoning all my skill with words, I said, "Your speech was great." Seriously. The woman was Mary Poppins, Maria, Queen of Genovia, and all I could think of to say was "Your speech was great." And she said in her refined British accent, "Thank you very much." It was a bonding moment. I then headed out to begin the primary activity of BEA: walking the floor. For some, "walking the floor" means that you go down each aisle in an orderly fashion, observing each booth and seeing everything. For me, "walking the floor" means walking in one direction, spotting something shiny, and veering off. If one isn't careful, one could confuse an autographing line for a bathroom line. Anyway, I began walking the floor with Laini Taylor and Jim di Bartolo, the author/artist duo responsible for Lips Touch Three Times. (Grabbed an ARC. Can't wait to read. Also can't wait to read the next book in Laini's gorgeous Dreamdark series, Silksinger). Laini and Jim are both super-awesome, and I wish they lived on the East Coast so that I could see them more often. Also Kate Schafer Testerman (a.k.a. 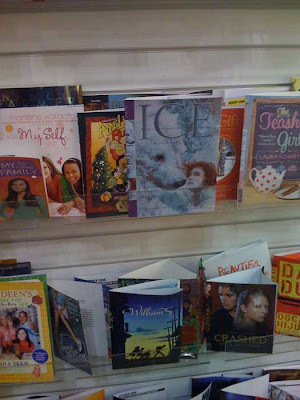 Daphne Unfeasible), Josepha Sherman, and many others. 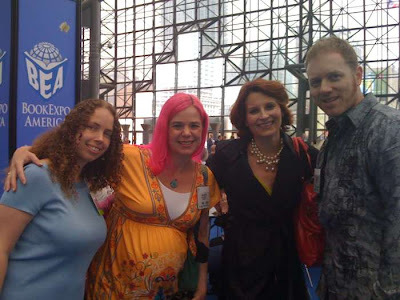 Coming soon: Part two of my BEA Trip Report: Friday Afternoon. Don't feel bad, but it caused me a physical pain to read this. HOW I WANT TO GO TO BEA! 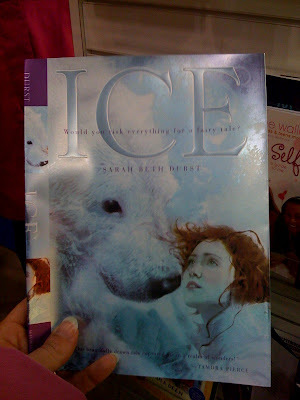 The ICE cover looks amazing & I bet that's nothing compared to the writing inside. Rob: Thanks! I am thrilled with the cover. The artist captured the characters perfectly. That is so cool! Looking forward to part 2. LUCKYYYYYYYYYYYYYYYYYYYYYYY! You are so very fortunate. I've heard it was fantastic...I'm on the edge of my seat, waiting for mooooooore BEA. 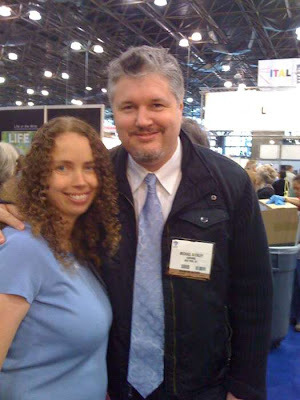 you got to meet so many of my fave authors( and of course, you are one of them too) how jeleous am i? 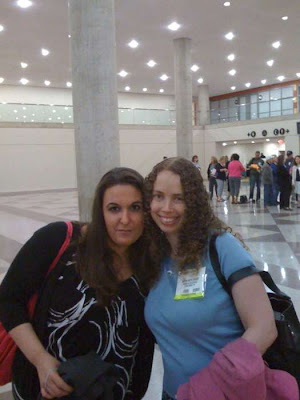 saying that i wish i could meet you/all the cool authors you've met is like saying han c andersen needed therapy lol. agg. Priya: Part two is now posted! I'll do part three tonight. Maya Ganesan: I feel very lucky. It was very cool. Hedgi: Lol. 4 months and 3 days to Ice! This is fabulous. I feel like a blogger stalker of the BEA. Beth: Glad you're enjoying! I had a fantastic time.